[This week’s review for The Nifty Tech Blog is a Guest Review by author Philippa Ballantine. Pip is the author of Geist and the co-author of the forthcoming Phoenix Rising: A Ministry of Peculiar Occurrences Novel . We are happy to have Pip’s review as part of her Blog Tour promoting the release of Geist. 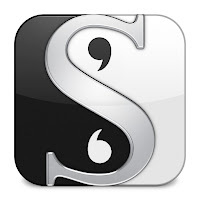 Scrivener has been my go to application for writing for the last three years. Ever since I got a Mac I’ve been using it. All my writing projects since 2007 have been on it, including Geist and Ministry of Peculiar Occurrences. It has always been a great programme—and even more when you consider it was developed by one man. 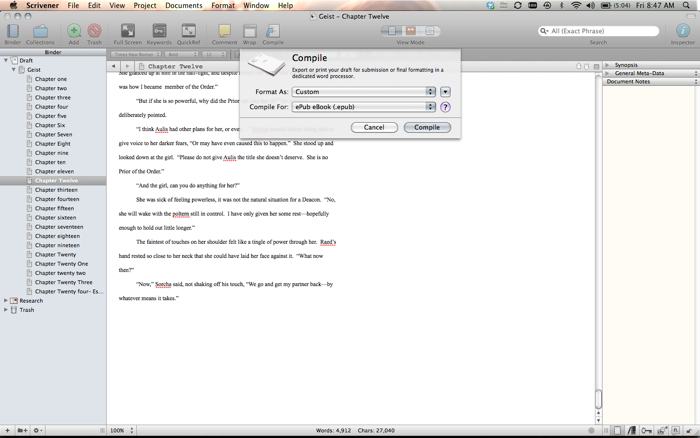 Updates to Scrivener have been regular, but this is the first new edition at least since I started using it in 2007. Scrivener allows writers to keep everything in their project together—not just their text, but also their research, their plot and their notes. This has always been the strength behind the programme, and why it has never been bested in this author’s opinion. The new features in Scrivener 2.0 are well thought out, and some of them impressive—but it retains that awesome core of previous versions. These are some of my favourite improvements. The Full Screen mode is the best mode to write in. Your words on a black back drop and you can you to widen or shrink the view depending how you like to have it. In the new version you can now use the Inspector to read comments from this mode, rather than having to pop back to the main window constantly. It’s added yet another layer of flexibility to this view. Compiling is the way to export your text once you are done with it. (I confess wincing on having to send MS Word files to my editor). One new feature under compile is the ability to now export as epub format or for the Kindle. This is a brilliant inclusion that I stood up and danced to see there. Finally at least, I do not have to deal with MS Word to get my epub done. 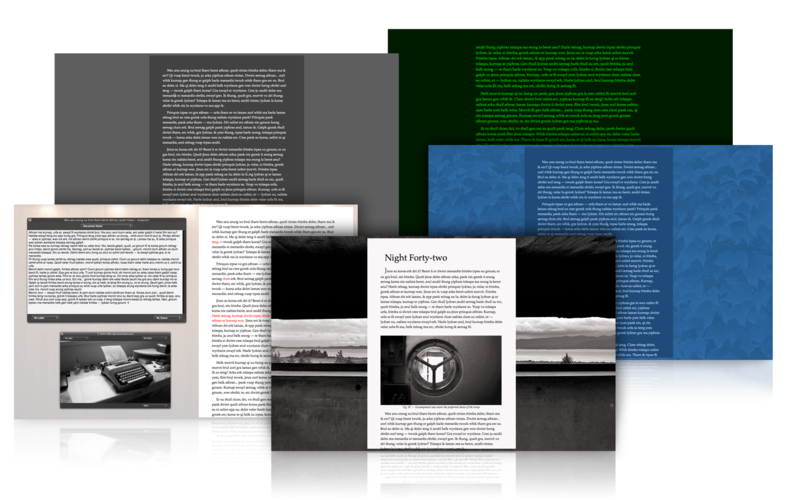 It let’s you manipulate your ebook output in any number of ways- so it is uber flexible. I have yet to use this yet, but it won’t be long. I have recently become a great fan of DropBox. A cloud based system for sharing and saving files, it has been invaluable—especially as I collaborate with people all over the globe. Also for an author keeping their files safe and secure is a big priority. One just needs to have one instance of losing (or thinking you’ve lost) your work, to teach you that lesson. 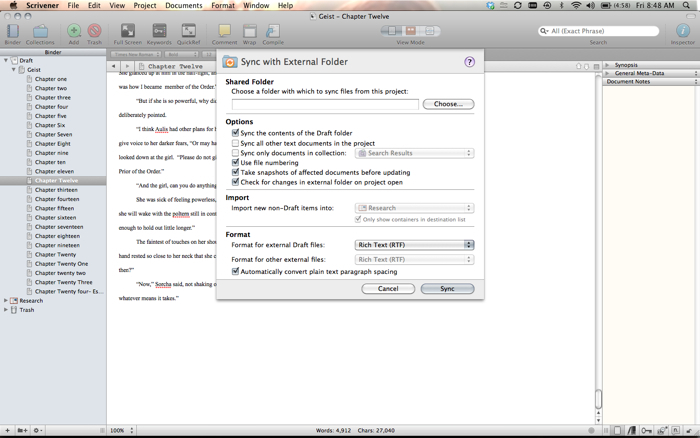 Scrivener files can now be synced to Dropbox as Rich Text files. If I was collaborating with someone then Scrivener assures us we won’t be writing over each others work, by checking with the external Dropbox file if changes have been made. You can then sync back to your file. There are a number of little additions that don’t rock my world, but are nice enough to have. The name generator is a fun little inclusion, though not much use for a fantasy writer. However it does let you generate a number of names from various cultures, and I can see it would be a useful for those outside the speculative fiction genre. It’s a purely aesthetic thing (at least for me as a novelist), but the introduction of page view is there. Now you can see how your text will look when compiled. It is supposedly included for screenwriters, but I really can’t speak to this. Another little aesthetic tweak is the ability in Full Screen mode to choose your own background. I still prefer to keep mine black, so that I can focus just on what I am doing. I am just getting into the Templates mode, but it is a great way of keeping things like character sheets which you will use again and again. Since I have always been a Scrivener fan, this new version doesn’t need to convert me. However what it has done is give me even more reasons to recommend it to writers. [Philippa Ballantine is a Fantasy author and podcaster and a former librarian. In the past year, she gave up the glories of Library Science in order to become a full time Author. Her novels Chasing the Bard and Digital Magic are available in print, electronic, and podcast form. Her unpublished novel (or perhaps unprinted?) Weather Child is available in podcast form. Her current podcast effort is the monthly Erotica a la Carte. Pip released her first Mass Market Paperback Geist from Ace in October 2010, and will be releasing her second Mass Market Paperback, along with Co-author Tee Morris, in May 2011 when Phoenix Rising: A Ministry of Peculiar Occurrences Novel is published by Harper Voyager. Spectyr , the sequel to Geist, is expected June 2011. In my opinion, not a bad start. Pip is from Wellington, New Zealand, and was previously featured in a Follow Friday segment. If you’d like to know more about Pip, visit her website: www.pjballantine.com, follow her on Twitter: @philippajane, or check out her Facebook Group page. Thanks for your comment. Pip did a great job with the review. 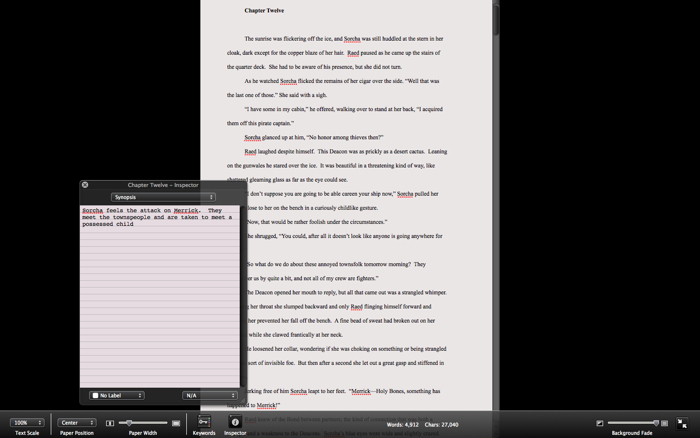 I have to say I’m also enjoying using Scrivener, although I’m sure I’m barely scratching the surface of what it can do. Next post: #FollowFriday – @BrightEyedDyer: Dyer, Writer, Editor, Podcaster, She who brings fiction to fiber.